For the fourth consecutive year, mid-August in Central Ohio wasn’t entirely devoted to the upcoming season for the Buckeyes or discussion about seats in the Shoe. Instead, like it has been, anticipation was built for a summer Sunday afternoon to talk hockey. Yes, for Columbus Blue Jackets fans, there is no better tonic for the summertime blues than this year’s iteration of CannonFest. First held in 2010, CannonFest was originally the product of the passions of fan-bloggers from The Cannon (of SB Nation), Full Mental Jackets, and the Dark Blue Jacket. What began as a gathering of hockey nuts has grown into much more. Now CannonFest is a must-attend annual event for any Jacket fan, featuring a bustling community of great hockey talk and camaraderie. Of course, it doesn’t hurt that the gathering has expanded to include multimedia and fundraising, but the aim still remains: CannonFest is a gathering of Blue Jacket fans organized and run by Blue Jacket fans. Coming into this year, the anticipation for CannonFest IV on August 18th was as high as ever. Whereas 2012’s CannonFest served as a sort of coping mechanism for the 30th place season-that-was (and a sort of preparation for the lockout to come), this time there was real excitement. Suddenly fans weren’t going to talk about more of the same. There was a Vezina winner on the team, a completely restructured management, a solid-looking draft class, and a dynamic new look to the offensive talent on the team. The lack of playoffs may have stung at the end of April, but the optimism for the future took the reigns on Sunday. Accordingly, CannonFest IV was also anticipated as a larger event than in the past. The venue was changed ahead of time to a more spacious Buffalo Wild Wings and neither the fans nor the event disappointed those who turned out. Hundreds of fans packed into the restaurant, decked out in their Blue Jackets gear, leaving only very rare open seats and buzzing with a desire to share. Carrying on from last year, the blogger turnout at CannonFest IV was impressive. Beyond the aforementioned Cannon crew (seen recording interviews with fans and contributors) and members of the Dark Blue Jacket blog, the guys from DKM Hockey had their gear in a corner of the room and spoke with a variety of fans for a future podcast (even doing a Jackets-themed Mad Lib with their guests). The Union Blue was also well represented, bringing a remarkable gathering of Blue Jacket community coverage under one roof. But the turnout wasn’t limited to the blogging community. Noted fan group the Arch City Army was out in force, pleasantly noisy as they cheered while running an NHL 13 (videogame) tournament. The Jacket Backers and the Blue Jackets Foundation also made return appearances, raffling off donated prizes, eventually raising $1,500 for the Foundation by the end of the event. Even pets were supported, with donations made to the Sedona Grace Foundation (a charity that supports families in need and their pets). The highlights of the event were wide-ranging. The DKM guys showed off their gut-busting “Vinny” Rolling Stones parody video seen below. Attendees giggled at most of the images (especially the Detroit Hindenburg item), but arguably the best part was the whispered verse. The Blue Jackets themselves also made an appearance with their mascot, community management, and digital media staff chatting with fans. But the greatest surprise of the event came in the form of none other than Columbus general manager Jarmo Kekalainen. The GM’s showing was seemingly a late addition to CannonFest, but kept very quiet by organizers. As soon as emcee Rick Gethin revealed Kekalainen to the crowd, the restaurant roared with support. Jarmo briefly addressed the captive audience, remarking about the anticipation for the upcoming season and noting his surprise at the size of the turnout for Sunday’s event. Kekalainen and the official Blue Jacket attendance is particularly remarkable for a fan-run event. There will be time for the organization to appeal to their fans (the upcoming Fan Fest among other open house activities). 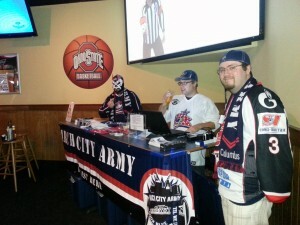 But Sunday, the club was seen tipping a cap at the union of fans and friends. These are the core of the franchise, and for the chief team architect to take notice is nothing short of outstanding positive feedback for all involved. But the true highlight of any CannonFest comes in the form of new highlight-tribute videos made by Tom Larrow (known to most as Skraut). Skraut’s work represents the gold standard of fan-produced videos and is well worth exploring in total on YouTube. This year’s featured debuts at CannonFest were no exception. The first was a tribute to departing Columbus play-by-play man George Matthews and can be seen below. Skraut brilliantly captured Matthews’ passionate style and was accompanied by local band American Dog. The second film was a set of highlights from the 2013 campaign with some knowing glances at the future (Nathan Horton and Jack Skille clips were tucked in for good measure). Not surprisingly, a star of the video was Sergei Bobrovsky (his mind-boggling series against Nashville is always an surefire way to drop jaws). After all the raffle prizes were awarded and the videos viewed, fans left full of food and hockey excitement. More than a few people were heard noting that they simply wanted the puck to drop immediately. But the takeaway for me was the continued presence of the strong hockey community in Columbus, Ohio. A fan-organized event founded by a few bloggers has grown to the point where an NHL GM has made an appearance and it seemed justified. CannonFest IV was a grand success by any measure and only serves to whet the appetite for more Blue Jackets and more community fun.